Asymmetrical zipper Creeper 750 ankle boot mixes vegan leather and microfiber for a unique style. 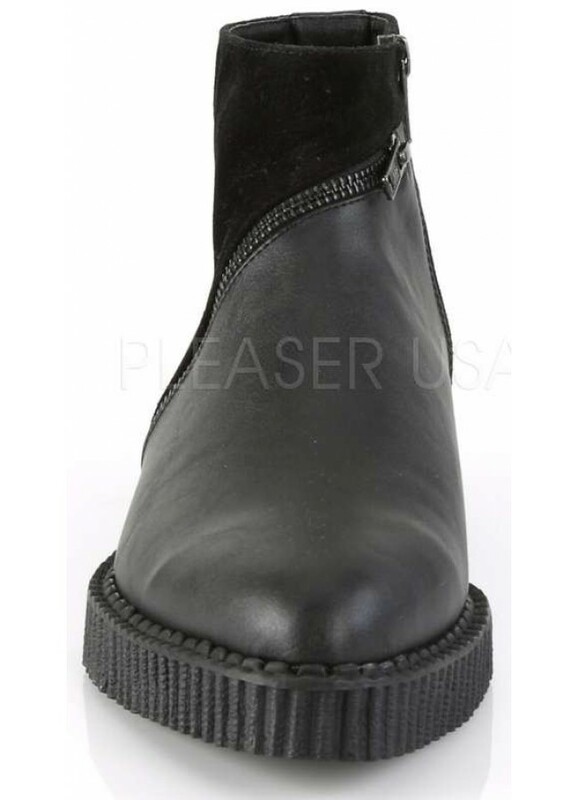 Black vegan leather Creeper bootie has a 1 1/4 inch platform heel with pointed toe, asymmetrical zipper detail across the vamp, and cone studs up the back. Inner zipper closure. Vegan leather upper with eco-friendly man made materials with padded insole and non-skid sole. Made in mens sizes (medium width) 4-12. Item Number: PL-V-CREEPER-750 | Approximate Size (Inches): 10.00 wide x 14.00 deep x 8.00 high | Approximate Shipping Weight: 4.00 lbs.